At the height of China’s Cultural Revolution a powerful general fathered two sons. Tan was born to the general’s wife and into a life of comfort and luxury. His half brother, Shento, was born to the general’s mistress, who threw herself off a cliff in the mountains of Balan only moments after delivering her child. Growing up, each remained ignorant of the other’s existence. In Beijing, Tan enjoyed the best schools, the finest clothes, and the prettiest girls. Shento was raised on the mountainside by an old healer and his wife until their deaths landed him in an orphanage, where he was always hungry, alone, and frightened. Though on divergent roads, each brother is driven by a passionate desire—one to glorify his father, the other to seek revenge against him. Separated by distance and opportunity, Tan and Shento follow the paths that lie before them, while unknowingly falling in love with the same woman and moving toward the explosive moment when their fates finally merge. 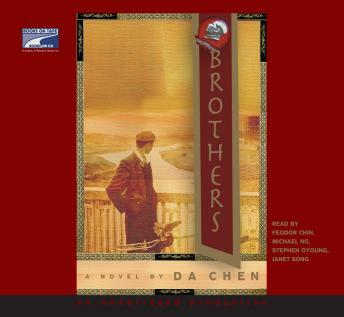 Brothers, by bestselling memoirist Da Chen, is a sprawling, dynamic family saga, complete with assassinations, love affairs, narrowly missed opportunities, and the ineluctable fulfillment of destiny.